"Besides the domestic training that the pupils incidentally receive in the care of their rooms, houses, and clothes--both boys and girls--the school, cooking school, shop, and farm give them more systematic instruction planned to fit the possibilities of their home conditions. Santee pupils are taught to make good bread, and to prepare plain, nourishing food economically, and from such materials as they have at home, or should he able to have. "The students are practiced in the essentials of stock raising and general farming. And in laboratory they have experimental demonstration of the more important theories of agriculture. The school also has an extension course with lectures by Santee teachers. Special classes are formed for adults who have had none or but few educational advantages. These are called "adult primaries." In 1903 there were 230 students catalogued, of whom 123 were in the correspondence school, 8 in the high school, 51 in the intermediate, including from the fourth to the seventh grades, 7 in the adult -primary, 40 in the primary, 18 in instrumental music, and 1 unclassified. The music scholars are included in the other grades. Looking at the bright and intelligent faces of the high school pupils one can hardly realize that these are the children of "wild Indians." They illustrate what Christian training can do and is doing for the Indian races. 1 Santee Normal Training School, by F. B. Riggs. In Santee there are representatives from different tribes including the Santee, Winnebago, Navajo, Sioux, and other tribes, but in Christ Jesus they are all one. Says Prof. Riggs: "During thirty-four years of Santee's history there have been great changes in the condition of all the Indians of the Northwest. Christianity has been the only power that has transformed barbarism into the beginnings of civilization." The Santee pupils, with scarcely an exception, are or become while in school Christians and church members. And in answer to the question: "Does an Indian on returning from school relapse to the heathen ways of his people?" Prof. Riggs answers, "No, never if he has become a genuine Christian." There are eighteen teachers and helpers in the Santee school, and the work which they are doing for the up-lift and Christian civilization of the Indian tribes can never be told by statistics, nor by a superficial study of the work done. It is only they who watch the progress of these Indian boys and girls as they go through the years of study in Santee, and then out among their people as leaders and helpers, who are competent to judge of the character of the work done in the school, and the transformation of the Indian into a Christian and honored member of society. And they have but one report to make, and that is that the Santee Normal Training School is an institution of untold blessings to the Indians of the Northwest. Into this Indian mission work the Riggs family have put their lives. "Dr. A. L. Riggs was born in the work," his father being a missionary among the Sioux in 1857, and his son is following in his steps. They have made Santee largely what it is, and are the inspiration of its growing work. This brief outline of Santee would be incomplete without a sketch of that remarkable indian preacher, pastor, and missionary, Artemas Ehnamani. leaflets and personal letters from Rev. A, L. Riggs, D.D., of Santee, who more than any one else is conversant with the facts of his life. Artemas Ehnamani was born at Red Wing, Minnesota, in 1825. His boyhood days were passed along the banks of the Mississippi river. As a young man he was tall, attractive, a lover of the chase, and ready for the war path, especially when opportunity came to strike a blow against the Chippewas, the enemies of his people. He also won for his bride the maiden of his choice, the most beautiful one in the tribe, and in this contest he had many noted rivals from the young men of renown. While yet in the prime of life he and his tribe ceded their ancestral homesteads along the Mississippi and moved on to the Sioux reservation on the Minnesota river. 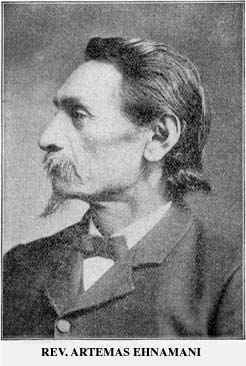 Ehnamani was a participant in the Sioux outbreak of 1862, and with the other leaders was captured, imprisoned at Mankato, Minnesota, and Davenport, Iowa, and condemned to death. While in prison he was converted, and became a devoted Christian, and was eventually pardoned by President Lincoln. His one book was the Dakota Bible, and the prison was his school. When he and the others were released from prison, they found that their families had been removed to Northeastern Nebraska on the banks of the Missouri River. table missionary superintendent among the Indian workers of his day, and yet was as humbly amenable to the discipline of the church as any other member. Dr. Riggs says that he "very humbly and courteously accepted the investigation and reproof of the Board of Elders when he was accused of having fired off a gun to kill the spirits causing the sickness of his wife. The truth was that he was humoring the whim of his wife, made childish and half demented by her sickness." His message to his people was that of the Risen Savior and Lord. He often made trips among the wild tribes of the Sioux and Dakotas as a Gospel missionary. He was licensed to preach in 1866, and in 1867 was ordained pastor of Pilgrim Church at Santee agency and held that position until his death in 1902. On account of railroad facilities Santee affiliated with the South Dakota Congregational churches more than with the Nebraska churches with which it is connected. However, from time to time Pastor Ehnamani attended the State Association of Nebraska, an interested spectator of its proceedings, and one of its principal speakers, though speaking through an interpreter. He has the distinction of serving a Congregational church as pastor longer than any other minister in the state. Ehnamani's second son, Rev. Francis Frazier, is pastor of Pilgrim Church which his father served so many years. a scholar and teacher of that science which makes for perfect manhood. Santee mission was under the American Board from 1866 to 1882, when it was transferred to the A. M. A.
Rev, John P. Williamson, D.D., Mrs. Sarah F. Williamson, 1866 to 1870. Mr. Edward R. Pond, Mrs. Mary F. Pond, 1866 to 1871. Rev. A. L. Riggs, D.D., Mrs. Mary B. Riggs, 1870 to 1882 and since 1882 under the A. M, A.